Every few months, the ongoing upheaval in the digital-music business forces its way into the public consciousness—Rdio goes bankrupt, Pandora hangs out a “For Sale” sign and then gets rid of its CEO, artists and labels ramp up their criticism of YouTube. Now we have Tidal in acquisition talks with Apple, while Spotify complains about Apple treating it unfairly. The media and music community seem divided on whether an Apple-Tidal combination would be a good idea. Some say it would be a huge mistake for Apple (AAPL), in part because Tidal hasn’t proven to be successful in either adding users or growing its business—although it has a number of popular features, including its access to artist exclusives. Others, however, argue that buying Tidal may make sense for a number of reasons, depending on the price. From a macro perspective, there’s a common theme among all of these developments: Namely, that the digital music business is becoming an industry in which only a truly massive company with huge scale and deep pockets can hope to compete. And that spells trouble for Spotify and every other independent music service. Rdio went bankrupt last year in large part because it couldn’t afford to make the licensing payments the record industry requires of streaming services. Deezer, a European service, postponed a planned initial public offering partly because its business is financially shaky for the same reason. And within months of announcing that it was acquiring Rdio last year, Pandora was reported to be on the block (although co-founder Tim Westergren has downplayed that idea since he took over as the company’s CEO). Tidal, meanwhile, has been shopping itself around almost since it premiered last year. It got a tidal wave of publicity because it was backed by hip-hop musician and producer Jay Z and a number of other artists, including his wife and fellow superstar Beyoncé. But the service has had trouble adding users, and is reportedly losing money at a fairly rapid pace. Realistically speaking, Tidal must be acquired by someone, whether it’s Apple or Amazon (which is also trying to grow its music service) or even Rhapsody, another music service with which Tidal has also apparently had discussions. Rhapsody—which recently announced that it is renaming itself Napster, after the pioneering file-sharing network it acquired in 2011—has been around longer than almost any other streaming service, but is still racking up massive losses for parent RealNetworks. Then there’s Spotify. 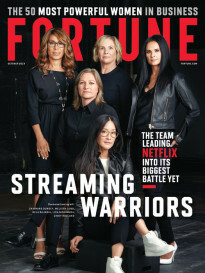 Over the past couple of years, it has become one of the world’s most popular streaming services with 100 million subscribers, 30 million of whom pay a monthly fee. But like every other music service, Spotify has found it almost impossible to make money, primarily because of onerous licensing payments. You can feel some of the tension coming through in the letter that Spotify sent to Apple, complaining that the company is using its control over the app ecosystem to harm a competitor. This behavior “continues a troubling pattern of behavior to exclude and diminish the competitiveness of Spotify,” the company said (Apple responded that Spotify’s latest software update was a clear breach of its developer rules, and that the company is “resorting to rumors and half-truths”). Last year, Spotify lost $200 million and had to raise $1 billion in debt financing just to remain in business. More than 85% of the revenue it takes in goes to music licensing costs. 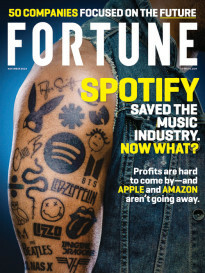 And yet, various players in the recorded-music industry—record labels, publishing companies, music distributors and even individual artists—routinely argue that services like Spotify aren’t paying enough, and that advertising-supported services like YouTube are even worse. Who is to blame for this state of affairs? That’s a difficult question to answer. The recording industry may want to blame YouTube and Napster, or even Apple, but the reality is that the way music is consumed has changed forever, and we are still figuring out how that works. At this point, all the available evidence seems to show that the digital-music business, at least the way it is currently structured, simply isn’t economic. The only way for anyone to even come close to making it work is to make it part of a much larger company, like Apple or Amazon or Google. That way they can absorb the losses, they have the heft to negotiate with the record industry, and they can find synergies with their other businesses. In other words, music as a standalone business appears to be dead, or at least on life support.